As probably any Cross Rhythms reader living in the Tees Valley area can tell you, the end of April 2008 saw a little bit of broadcasting history. For it was then that the Cross Rhythms Teesside radio station went on air on 107.1 FM and it's been broadcasting 24 hours a day, seven days a week ever since. When one listens to its punchy output of contemporary Christian music - with its mix of programmes originating from Cross Rhythms Stoke-on-Trent and Teesside originals like Matt Brown's engaging Breakfast Hour and Benni J's madcap weekday afternoon The Benni J Show - it's sobering to realise that it was nothing short of miraculous that Cross Rhythms Teesside ever got on air. Three Teesside businessmen had originally had talks with Cross Rhythms and subsequently applied for an FM Community Licence in 2005 but by the time the licence was granted by Ofcom two of the three had had to drop out, leaving sole radio visionary Andy Robinson with a mountain to climb. Andy approached Ben Jack (who is known as BenniJ when he deejays and Galactus Jack when he makes albums), who had recently quit his job teaching deejaying skills to excluded young people, and asked him whether he would come and work for Cross Rhythms Teesside. At first Ben said no. He commented, "To be brutally honest I thought, 'Why do I want to get involved in Christian radio?' You know, 'entertaining Christians.'" But Andy persuaded Ben to go and meet Jonathan Bellamy, presenter and CEO of Cross Rhythms, Stoke. Continued Ben, "I came and met with Jon and in a half hour conversation with him he must have said all of the key words that most excited me, 'authenticity', 'community' and all those things that Cross Rhythms actually was all about. I was just like, 'Wow, this is incredible,' and suddenly I was going to do it. It needed more thought but that was really the turning point. It was about two and half months from Andy asking me if I wanted to do it and me saying yes. That was in mid-March 2007. I moved up to Teesside from where I was living in Lincoln in September 2007 and then we launched the station in April 2008. It was a very tight window." A tight window indeed. The rules of the licence were that the station had to begin broadcasting within two years of it being granted. For the first few months Ben worked out of his house and even when the station located in the Stockton Business Centre there were a myriad of details to sort out before the two years were up, not least the location of the broadcasting mast! Remembered Ben, "We found a place to put the mast in the end. We had all sorts of problems there. The highest buildings in Stockton were a couple of blocks of flats and both of the tops of them were owned by big telecommunications companies and you had to sublet through them if you wanted space. We couldn't get permission to go up there in time and it was all against such tight timing on everything. So in the end we decided we'd go on the top of the Business Centre which was still pretty high but we were concerned that there was a big building in the way on one side and we weren't sure if it would block part of the signal. Also, we were going through the Stockton Borough Council and they were running us right to the deadline. It seemed that every time we would hit decision day they would come back to us with another set of things to be done that would push decision day back a week. It was like jumping through hoops that were getting smaller and smaller and smaller. It was hugely challenging." The days leading up to the station's launch are etched forever in Ben's memory. "The studio was built in the last two weeks. It really was madness with the launch date getting closer and closer. We were praying about it and really trying to listen to God about direction. We borrowed Chris Mountford from Stoke-on-Trent for the day and he actually hosted the first on-air show that went out which was a live link up to our launch event which was happening in Stockton Parish Church, in the centre of Stockton-on-Tees. After that a group of us went back to the studio with me putting the fader up. Going live for the first time on air is definitely something that will stay with me for a long time." Ben is thrilled with the positive response that Cross Rhythms Teesside has had since it's been on air. 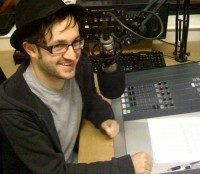 "We're often hearing from people who love the station, for the effect it has on the community if not the music itself. I've been a DJ for 10 years and my grandmother, who is 87 years old, supports what I do wholly. She can't stand the music I play, but she supports what I do because she loves me and she believes in the project. That's really the attitude we need among the Christians in the Tees Valley. The music may not be to the taste of older Christians. But it's actually about seeing the bigger picture and saying, 'It's not necessarily what I like but I can see it connecting with a lot of people.' There's a distinct difference between what you like and what you think is good and we challenge anybody, wherever they live and have access to a Cross Rhythms station, to really put this perspective first in their mind. 'Do you think Cross Rhythms is something that is good for the community?' Because if it is then that's the starting point and everything else will fall into place around it." Really enjoyed the Jamaican gospel music that play at night. But i can't seem to understand the DJ. May I kindly ask what are the title of the songs that you play during that time? How to get a copy?